Went to see Rock of Ages again with two high school friends today. We usually meet up once a quarter to go out for dinner and it was my turn to choose the restaurant....so I asked if we could switch things up and see a matinee of the play instead. SO FUN! Also, recap of last night at Blue Hill at Stone Barns. BEST MEAL OF MY LIFE. We started at 6:30 and ate and drank until close to 10:30. 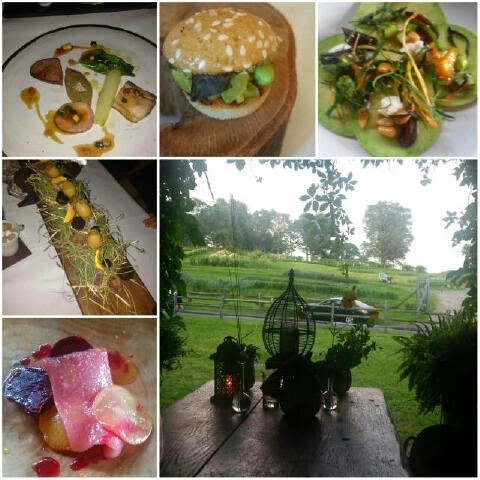 Our table was even selected to sit outside for 2 courses (bottom right pic). We also were allowed in the kitchen and saw Dan Barber in action. What an incredible night.